Given that iTunes is the most widely used iOS data management program it's only safe to assume that it will work flawlessly. However, this isn't the case and many users are inconvenienced by the problems that iTunes causes them - in this case, we're talking about why won't iPad sync to iTunes. This bothersome iTunes issue prevents iOS users from syncing their iPad and today, we're going to focus on how you can fix it. While this is a frustrating issue to deal with, especially if you've got a busy day that you want to get on with, there are a few things that you can try to quickly fix it. The first thing you should try is updating your iTunes to determine where the problem is stemming from. 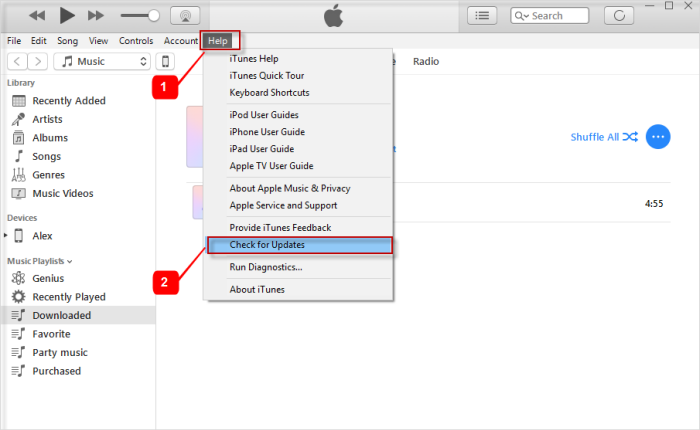 If iTunes has a problem or a bug which has been fixed in a recent update then by updating iTunes, the chances are that the issue will be fixed and you'll be able to sync your iPad afterwards. When you first open iTunes, if an update is available then a notification should prompt you to update. If you don't see this notification, then click on the "Help" tab followed by "Check for Updates". If an update is available, simply download and install it, and your iTunes will be reinstalled with the newer version. If updating iTunes doesn't work, the problem lies elsewhere (possibly your settings). The issue might simply be that you haven't chosen to sync the types of data that you want iTunes to sync with your iPad. When you connect your iPad and iTunes is launched, click on the device icon at the top of the program and the summary page will be shown. Using the left panel, click on one of the data types that you want to have synced (e.g. Music, Movies, Podcats, etc). If the box next to, for example, "Sync Music" hasn't been checked then go ahead and check it now. From then on, whenever you sync your iPad with iTunes, that data type will be synced. Following on from the first tip that we gave you if an update isn't available then it's a good idea to uninstall and reinstall iTunes on your computer. Doing this will not only install clean versions of the iTunes program files but it will also reset all of your preferences (which is preferred as if there is a problem with the settings file, the problem will be fixed). 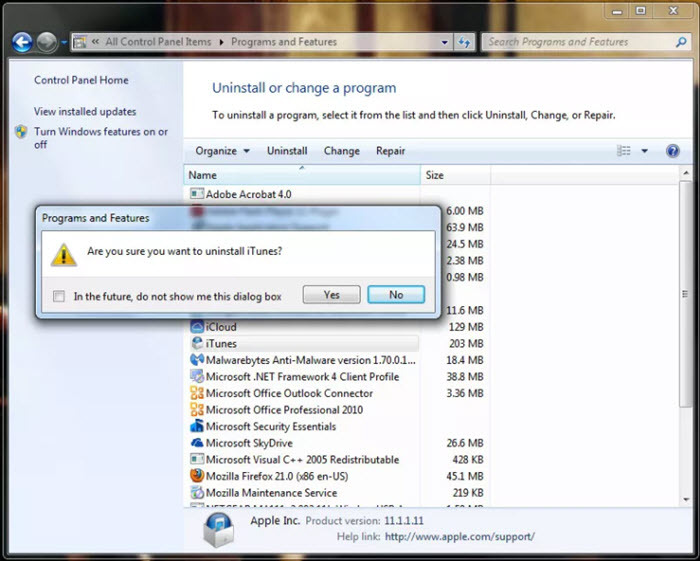 To uninstall iTunes on a Windows computer, go to the Control Panel and click on "Uninstall a program". Locate iTunes, click on it, and click the "Uninstall" button at the top of the menu - after a few minutes iTunes will have successfully uninstalled, and you can re-download it from the iTunes download website. Obviously, this won't fix the problem, but by choosing to sync your iPad with iCloud then you don't have to worry about your iPad not syncing to iTunes and you can have better management over your iPad's data. 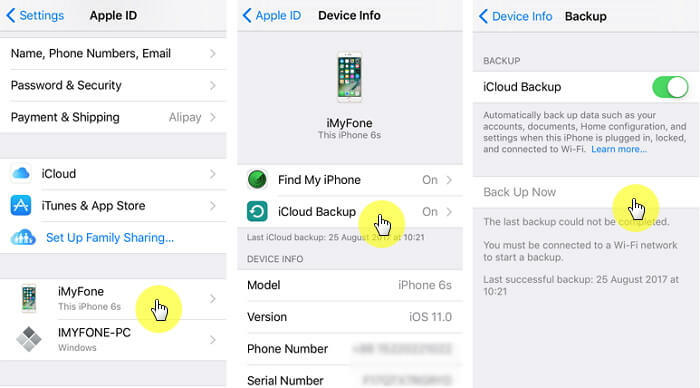 To take an iCloud backup from your iPad, open the "Settings" app and go to "Apple ID > iCloud > iCloud Backup", and tap on "Back Up Now". 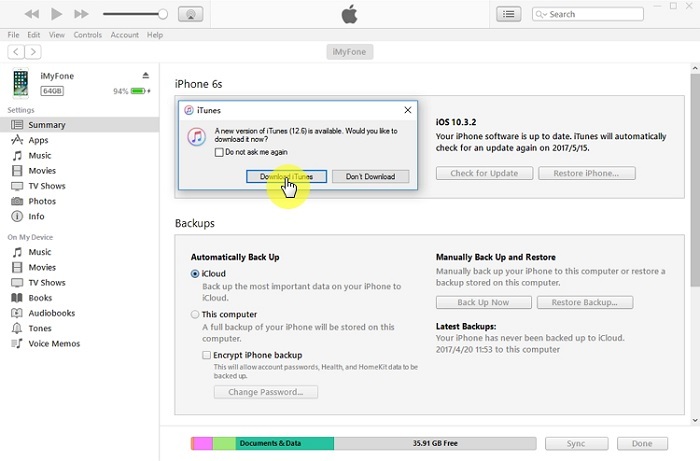 After a few minutes, your iPad's data will be backed up but if you have the "iCloud Backup" slider enabled on this menu then your data will automatically be synced with your iCloud account regularly. In the event that none of our tips helped yield the results that you expected and you're still wondering why won't my iPad sync to iTunes, try using an iTunes alternative like iMyFone TunesMate. This program is just as effective as iTunes and below are some of the features that it includes. Sync virtually all iTunes data including music, ringtones, playlists, videos, movies, podcasts, and much more. 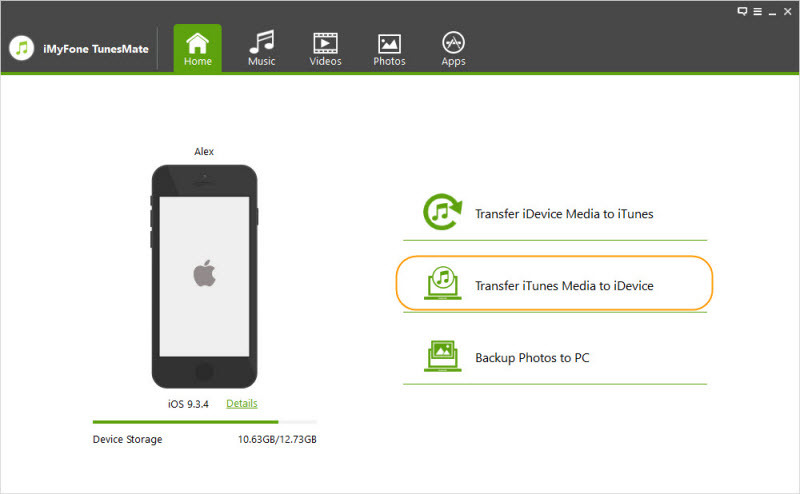 Transfer data freely between your iPad (or any other iOS device) and your iTunes library. Sync your iPad without having any of your data overwritten by iTunes. Transfer media files directly without opening iTunes. Share both non-purchased and purchased media with multiple iOS devices, without iTunes limiting you. Highly spoken by many professional software review webistes, such as Getintopc, Geekreply, tricksworldzz.com, etc. In hindsight, iMyFone TunesMate is a version of iTunes without any of the unnecessary limits and if you want to sync your iPad with this program, follow our guide below. Step #1 - Download, install, and launch iMyFone TunesMate on your computer. Step #2 - After connecting your iPad and launching the program, click on the "Transfer iTunes Media to iDevice" feature from the main menu that is now shown on your screen. 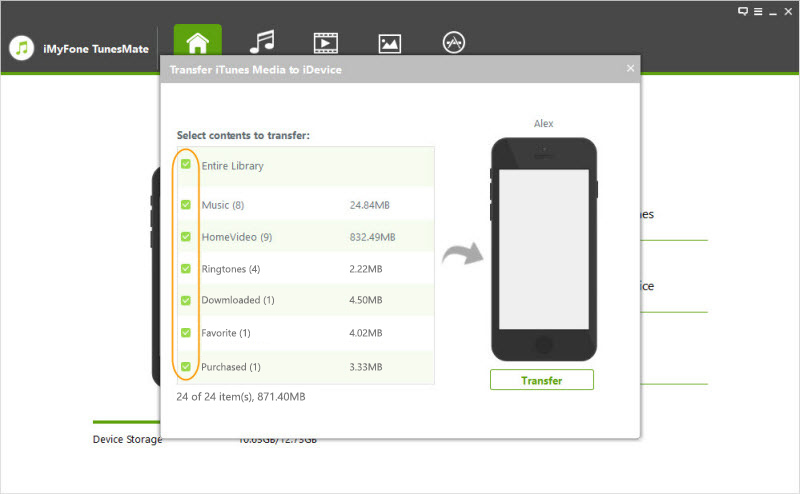 Step #3 - Using the box that appears on your screen now, select the types of data that you want to transfer from your iPad to your iTunes library. Alternatively, you can check the "Entire Library" to have everything synced. Step #4 - Click on the "Transfer" button to proceed and after a few minutes, you'll find that the sync process was successful. Now, if you take into account the struggles that you had with iTunes and trying to figure out why won't my iPad sync to iTunes, it's a lot easier if you just use iMyFone TunesMate. No longer will you have to struggle with iTunes causing you sync issues. If you've tried each of our tips but you are still unable to sync your iPad, take a look at iMyFone TunesMate - we highly recommend using this program over iTunes!